By the time summer rolls around I am going to be in my third trimester and I will be very very pregnant and uncomfortable. So I am planning ahead! 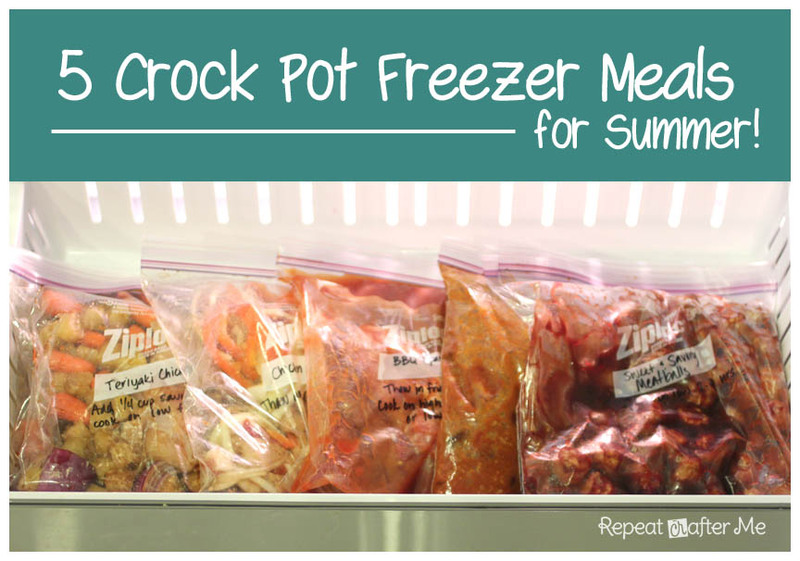 I found some great crock pot freezer meal recipes that I think will be great for summer. By doing the prep work now, all you need to do is thaw your pre-made meal and throw it into the crock pot. No need to slave over the stove or turn your oven on during the summer heat. Easy meals mean more time outside enjoying the weather! There is nothing better in the summer than a ice cold Corona and lime and some mexican food! 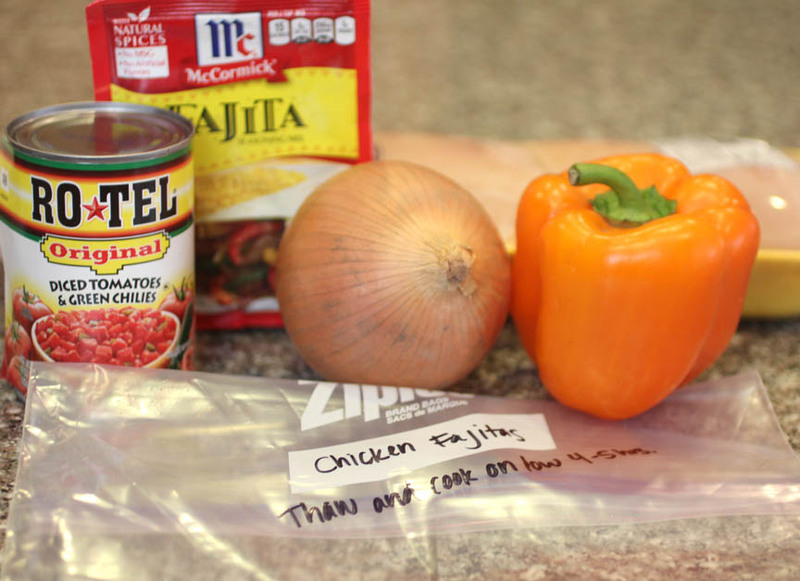 These crock pot chicken fajitas will be a great meal. Be sure to pick up some tortillas and sour cream and shredded cheese for toppings when you are ready to cook this. Label your Ziploc bag and add the chicken strips. Add in the fajita seasoning and smush around. Add the rest of the ingredients and mix around. Lay flat in your freezer. When ready to eat, thaw and dump everything into the crock pot. Cook on low for 4-5 hours. 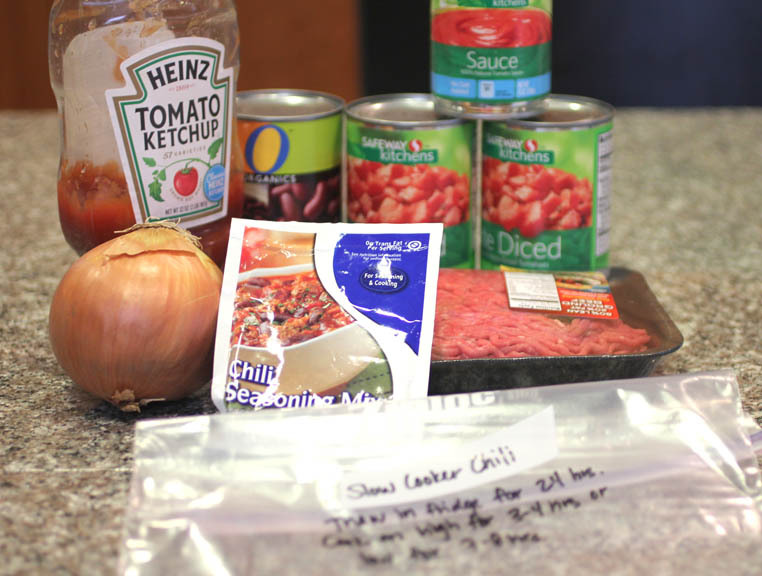 I chose this chili recipe because I thought it would make great chili burgers or chili dogs. 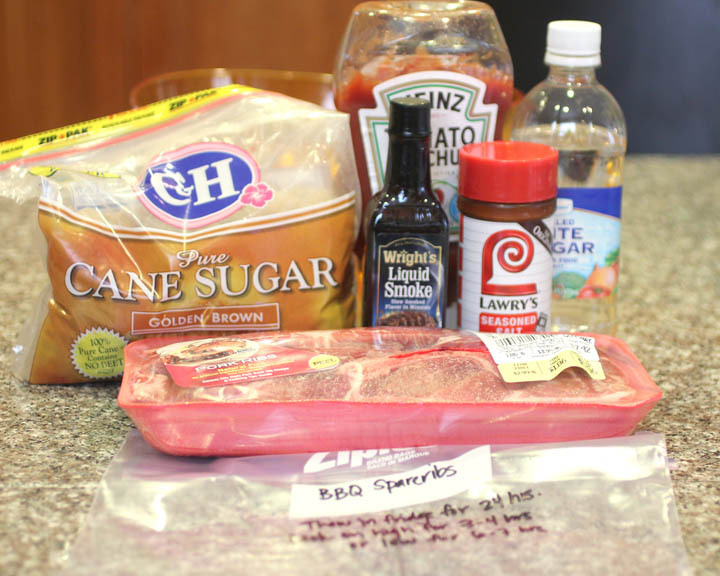 We love to grill in the summer time and this will make a yummy topping for hot dogs and hamburgers. Brown ground beef and diced onion together. While it is browning, mix all other ingredients in gallon size freezer bag (be sure to label your bag first!). When the meat and onion is cooled, add it to bag. Mix around and lay flat to freeze. When ready to eat, thaw in fridge for 24 hours. Cook on high for 3-4 hours or low for 7-8 hours. Nothing says summer like some BBQ ribs! Label your gallon size freezer bag and put in pork ribs. Mix remaining ingredients together in a separate bowl and pour over ribs. Seal bag and place in freezer. When ready to eat, thaw in fridge for 24 hours. Cook on high for 3-4 hours or low for 6-7 hours. I thought this would be a great dish for summer BBQs or potlucks. You can serve them by themselves or put over white rice! Mix BBQ sauce and grape jelly together in a separate bowl. Split the meatballs between two bags. Pour sauce evenly between both bags and mix around. Lay flat and freeze. When ready to eat, cook on low for 2-4 hours. 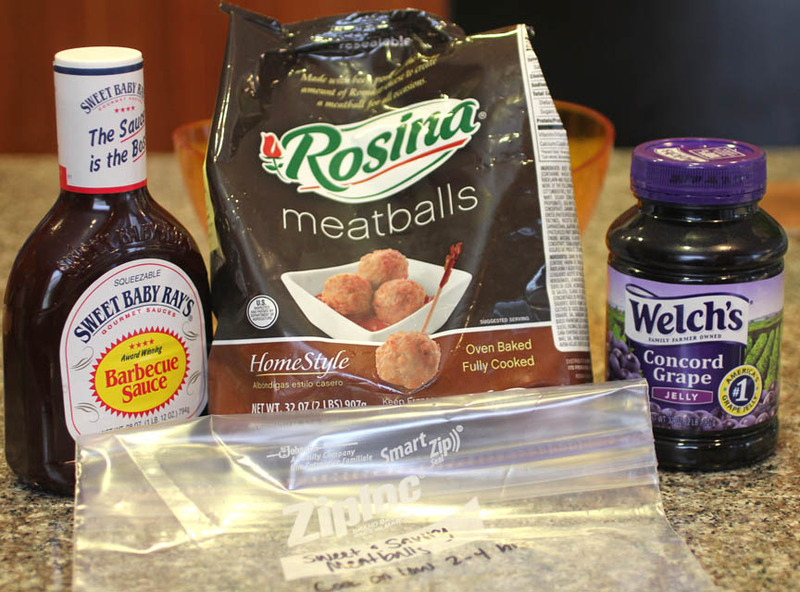 Label freezer bags and split all ingredients into two bags. The ingredients are easy to split up evenly. Smush around in bag to make sure everything is mixed. Lay flat to freeze. When ready to eat, add 1/4 cup teriyaki sauce to crock pot and cook on low for 6-7 hours. I am thinking of making a master shopping list. Let me know if this is something you would be interested in! Does the meat need to be cooked before putting in the bags? Some people brown their meat before putting in a slow cooker, but I never have. Thank you so much!! I really need these and I love that you've given us the links so we can choose more recipes. You're so thoughtful and generous! BTW, I made one of your owl hats the other day…too cute!! Would LOVE a master grocery list! This would be GREAT for lazy days! Awsome recipes and a great idea!! Great recipies for freezer/crockpot cooking. Pinned. This is so great! I love prefrozen crockpot meals. Thank you so much for sharing this. I will be pinning and would also love for you to come and share this on our link party. I am definitely interested in any shopping list – or even more of these great freezable meals that you would like to offer!! *** NEED 7 Gallon Freezer Bags- I didn't realize at first that 2 of the recipes were split between 2 bags. So, I did it! 5 meals (which I think I can get 10 meals out of for just my husband and me) are in the freezer are ready to go! Thanks Sarah!! 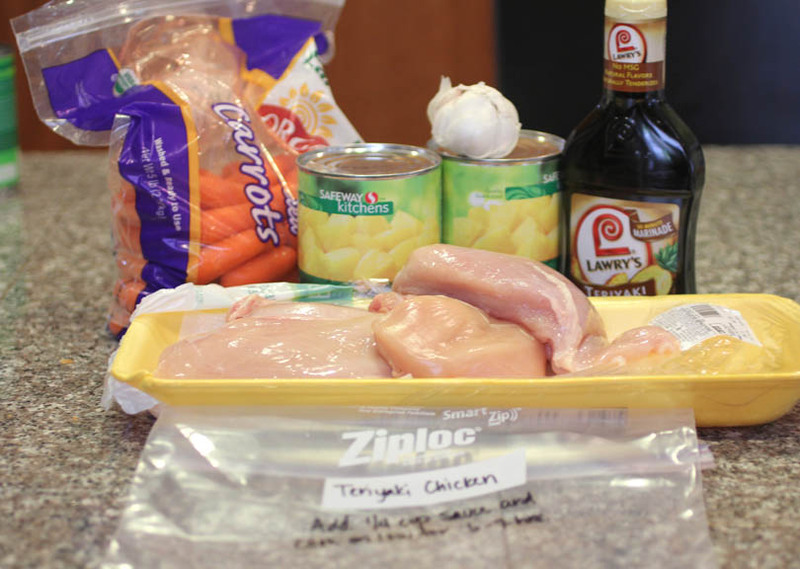 -For the teriyaki chicken, use baby-cut carrots, mince the garlic cloves, and cut the chicken breasts into halves or fourths. -For the chili, the kidney beans should be drained. -For the ribs, if your grocery store only has racks of ribs like mine, cut them into chunks that will fit in the bag. Thanks for the list and the tips..can't wait to try this myself. All of these look great! Can't wait to try them. I work late..home at 8pm most nights and this will keep my husband from running out to get take-out on my late nights. Congrats! (I'm sure you've had the baby) Our baby is 7 weeks old now. =) I can't wait to try this. Our family has 2 teenagers, an 8 y.o., 3 y.o., and us parents who will be eating off this menu. Do you think I should double the ingredients? I have a large crock pot.